I made this because the small model V-rotor self started easily and ran smoothly. 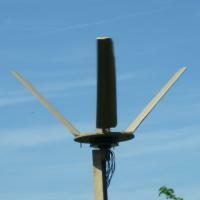 The rotor was designed to have 3 blades with the blades angled at 45° to the vertical. The section is NACA 0018 curved to take account of the circular path and the chord width of the blades was a guess. 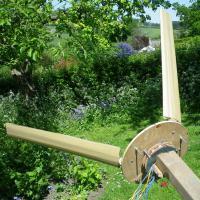 I've tried the rotor with the blades tilted up at a greater angle and also with both two and three blades. The pictures show it in the various configurations. 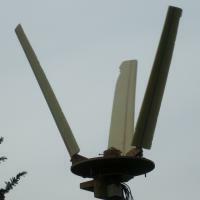 With the blades angled more steeply the turbine would rotate faster when not under load but did not seem to have the torque to drive the alternator. The 2 blade version suffered in a similar manner so it has largely been run as the original three blade design. 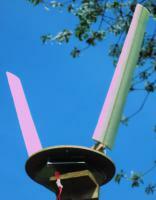 The blades are made of some scrap insulation foam stuck to a central spruce spar which takes the load. To get the shape I cut root and tip templates that were about 10mm over size and then rolled the blade over a small sanding disk sticking up from a router table. The end result was a reasonable shape but the spars always ended up standing slightly proud. The foam was also very delicate and the thin trailing edge soon became a bit ragged. When I covered the blades in parcel tape there was a noticeable improvement in performance. The angle of attack of the blade is reduced by angling the blade to the airflow. This reduces the peaks in the angle of attack as the blades rotate. The speed ratio varies along the blade which would complicate any attempts to get the whole blade operating in an optimal manner. It does, however, mean the tips which cover the greatest part of the frontal area could be optimised for a higher tip speed while still allowing the rotor to self start. The blades are also unlikely to stall along their length in the same way as a vertical blade which may contribute to the smooth running. Any drag associated with the connections to the hub is in a low speed area. 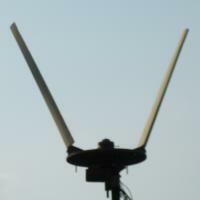 The frontal area is quite small compared to the radius so the rotor seems quite large. The obvious option would be to add blades below the hub to make an H-rotor with a waist.